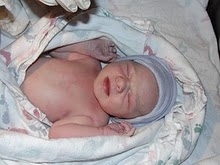 Hazel Marie was the first baby girl of the New Year at ISJ Hospital. She came out crying and snuggled against her mommy’s chest. She was a daddy’s girl. Ryan spoke to her softly while they cleaned her up and she just looked at him. She was so beautiful. She spent her first night in the nursery. The nurses brought her in around 3:30 to be nursed and she did so well. But around 6am they came in and told me they had her on oxygen and wanted to keep an eye on her. They weren’t too concerned at the time so I wasn’t worried. That morning a Pediatrician gave us the all clear to take her back to our room. They had ran some tests and everything was coming back fine. We had visitors all day. About 7pm Hazel and mommy were finally going to get some time alone together. The nurse came in to check vitals while she was nursing and asked to take her back to the nursery. Her heart was racing. Hazel was put on oxygen. She was very unresponsive, her color was yellowish, and you could see her heart pounding in her chest. They decided to airlift her to St. Mary’s in Rochester. She was baptized before she left. I remember hearing the helicopter leave at 3:30am.